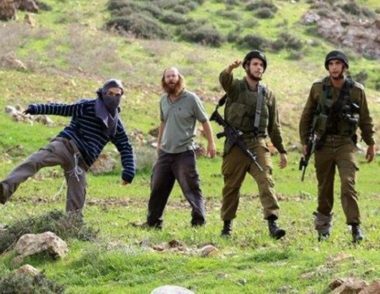 A number of illegal Israeli colonialist settlers attacked, Friday, Ein Samia and Marj ath-Thahab area, in the al-Mughayir village, northeast of the central West Bank city of Ramallah. Media sources said the colonists came from an illegal outpost, which was built on private Palestinian lands, and assaulted many farmers and shepherds. They added that the villagers then rushed to the lands, and managed to force the assailing colonists away. It is worth mentioning that the village, and its lands are subject to frequent assaults by the illegal colonists, in addition to repeated Israeli military invasions.